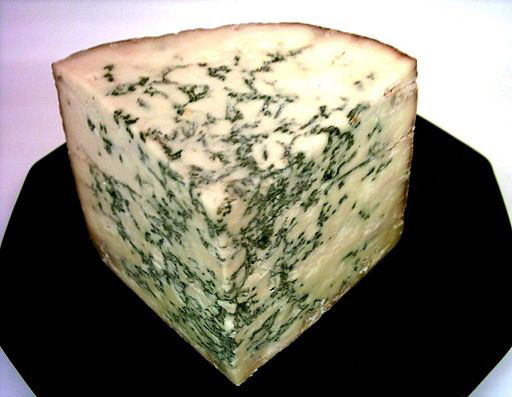 English Food: Cheese | Notes from the U.K. The last time I wrote about English food, it was to make fun of baked beans. So let’s talk about a good part of English food: The English are known for their cheese, and justifiably. Cheddar takes as much space in the cheese aisle as baked beans do in the canned vegetable, only it tastes good. And it’s not just connoisseurs and food snobs who go in for the strong stuff, it’s normal people—kids, adults, people who eat baked beans on toast. Cheese turns up in soups, in sauces, on baked potatoes. Okay, everything turns up in baked potatoes, but still. If a store only sells one vegetarian sandwich, it’ll be cheddar. And it’ll be grated, not sliced. “Due to warnings from the police … a substitute, plastic cheese was used this year, so a real cheese was not in fact rolled*. The only injuries that year were a dislocated shoulder and a broken leg. It took more than two hours to get the guy with the broken leg off the hill, with the rescuers walking backward and held back by ropes. It’s that steep. But, hey, the prize is a cheese, right? One winner said publicly that she didn’t like cheese and was going to offer her prize on E-bay. The bids didn’t come up to reserve price and I hope she learned to love the stuff, because she was the proud owner of an eight-pound wheel of the stuff. This entry was posted in Food and tagged Americans in Britain, Americans in England, anglophile, cheddar, cheese, England, English cooking, English food, Gloucester cheese race by Ellen Hawley. Bookmark the permalink.